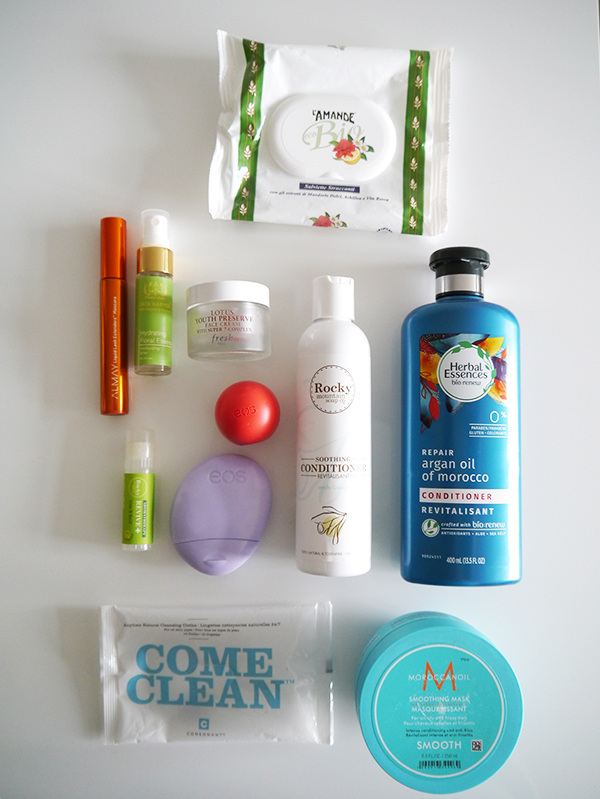 This empties post has been a long time coming! I originally intended to publish it in November, but with one thing or another it's been pushed out. So without further ado, here are the products I've finished up in the, erm, recent past. Quick notes: Why do conditioners always seem to run out before their shampoo bottle counterparts? I loved this one for its scent and the fact that the all-natural formula felt like it was truly moisturizing instead of just coating strands with keratin and silicone. On particularly parched days I'd use a bit more and keep it in my locks until rinsing at the very end of my shower—sort of like a quickie hair mask. Quick notes: Performs well in conditioning and detangling strands and fighting frizz. This is a great everyday conditioner option if you're looking for something at the drugstore level. Would I repurchase? Maybe. 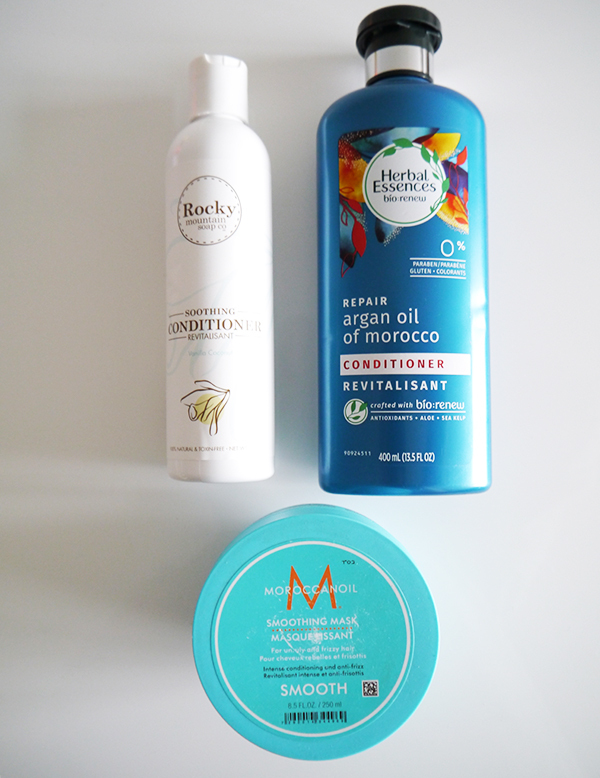 Although I'm trying to go more natural with my hair care, my husband is still into drugstore shampoos and conditioners. Quick notes: I received this product sample so long ago, I can't remember which PR or retailer it came from. (Sorry!) This giant tub of product took ages to use up. I liked the way it smelled and it always resulted in a dramatic improvement in the softness and shine of my hair. However, it wasn't exactly a Holy Grail product—I kept straying from it and using other ultra-moisturizing conditioning treatments that were more affordable and just as effective. Quick notes: Portable, convenient, affordable. Fast-absorbing. I wasn't a fan of the scent, which seemed very artificial and cloying. And while the formula contains a lot of natural ingredients, it also has BHT which I'd rather avoid. 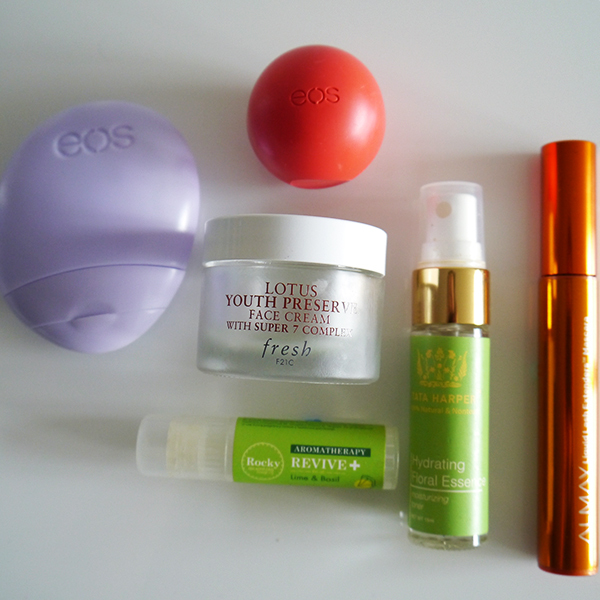 Quick notes: Love the pomegranate raspberry flavour, the packaging's red-pink shade, and the all-natural formula. It looked adorable on my beauty blogging desk (and matched the office decor nicely!) and moisturized effectively. Quick notes: I never notice extraordinary results from Fresh's Lotus Youth line, but I do appreciate the fact that they're basic, effective moisturizers suitable for all skin types and they get the job done. If I'm traveling or I'm looking for a moisturizer to slip into my gym kit, I never have to worry about this line clogging pores or causing breakouts. Quick notes: The mini size was so handy for quick hits of refreshing hydration during our Italy trip! This isn't my first time using up a bottle of Hydrating Floral Essence and I continue to enjoy this product for its mix of active botanicals, floral scent, and high hyaluronic acid content. I originally received this sample from BeautyMark, which is selling its remaining Tata Harper stock at 15% off before they close their doors for good on March 15. Quick notes: Thhe scent wasn't powerful enough to override the beeswax aroma of the base. I ended up re-purposing it as a lip balm because of the formula's emollients. The Aromatherapy Sticks have been discontinued, but there is good news for Rocky Mountain fans looking for aromatherapy products: They have a new line of wellness balms! I've been testing these and like them so far; more detailed review coming soon. Quick notes: I received this sample at the latest #LDBeauty media preview and was immediately intrigued by the idea of a dramatic tubing/lash extension mascara from a brand known for natural beauty and sensitive, hypoallergenic formulas. The mascara produced a natural-looking fluttery effect but didn't give me OTT length or volume, and it smudged slightly. Pass. Quick notes: Random purchase from an Italian erbolario! The clerk spoke zero English, but I figured a couple of euros for what looked like all-natural makeup wipes from a brand I'd never heard of was worth at least one try. These wipes turned out to be a disappointment—they weren't saturated with enough product and sometimes they stung—but the Italian packaging made me happy. Quick notes: Saturated with product, doesn't sting, fully biodegradable bamboo, all-natural. Pricey compared to drugstore alternatives though. Quick notes: These were more expensive than the $2-a-box cotton pads I usually buy at Japanese discount stores and they didn't perform as well. The cotton ripped apart easily and left lint. Quick notes: This little jar of Resurfacing Mask is a cautionary tale against opening a product and saving the remainder of it for a special occasion. My bridesmaids and I had used it before the wedding and loved the glowing results. Sadly, I hadn't used it since and the next time I opened the jar, the mask was a gummy congealed mess that had to be thrown out. Would I repurchase? Yes, but I'd make sure to use it up in a sensible timeframe! 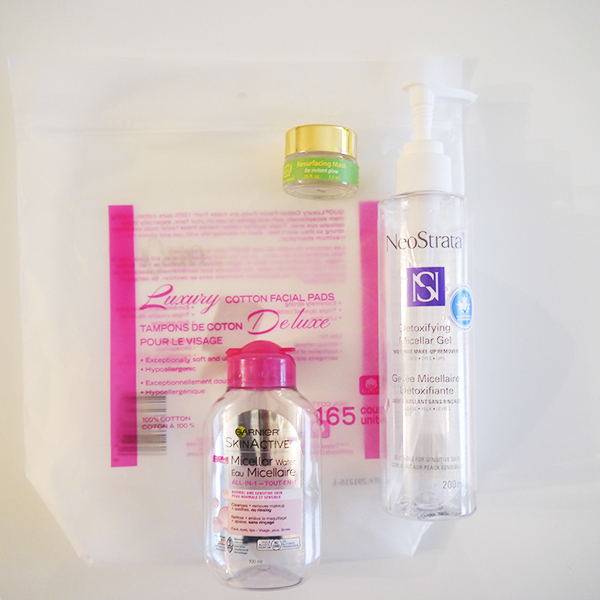 Quick notes: Pretty sure micellar water is now a regular fixture in my skincare routine! I like the gel texture of this one (it's a nice change and feels squishy and soothing against the skin), but it does leave a bit of residue behind. Quick notes: I bought this little 100 ml bottle of Garnier Micellar Water to serve as cleanser and makeup remover during our Italy trip. It was a travel-friendly size and did the job and I loved how affordable it was. This product usually invites comparisons to the original Bioderma micellar water because of its pink cap and the fact that they're both micellar waters. 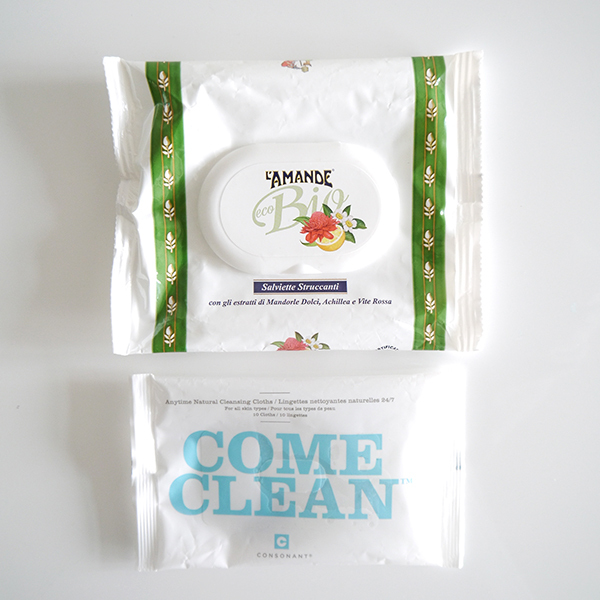 However, I prefer Bioderma as unlike the Garnier version, it leaves a cleaner feel and doesn't contain parabens. Would I repurchase? If I was feeling frugal, yes. Otherwise I'd spring for Bioderma.